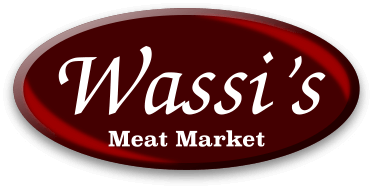 For the ultimate in flavor and quality, Wassi's Meat Market has a wide range of all natural poultry products, including Chicken, Duck, Turkey, Cornish Game Hen and Quail. Impressive as well are our many dishes that we create with these different meats, such as our Pot Pies and Stuffed Chicken Breasts. Please allow a minimum of 48 hours for pickup. Cannot be prepared without a valid phone number,credit card and email address.We will email you to verify order and give you pickup time and date. All internet orders will be wrapped for two people. $2.19 lb These succulent bone-in, skin-on breasts are ready to prepare. Grill, broil or pan sear to your heart's delight.This item cannot be shipped. Local store pick up ONLY. ..
$3.49 lb Grade A Premium Boneless Skinless Chicken BreastThis item cannot be shipped. Local store pick up ONLY. ..
$2.99 lb Grade A Premium Boneless Skinless Chicken ThighsThis item cannot be shipped. Local store pick up ONLY. ..
$2.99 lb Grade A Premium Fresh Buffalo Style Cut WingsThis item cannot be shipped. Local store pick up ONLY. ..
2 for $15.00 (8oz. ea. avg) Boneless Duck Breast/Skin On Boneless breasts offer delicious flavor with minimal preparation; pan-sear, roast or grill. Think of duck breast as the new steak: meaty and lean with delicate, thin skin that crisps beautifully when seared, roasted or quickly charred over .. The Briner completely resolves the #1 challenge to successful brining - floating food! Our Patented design has an internal locking system that keeps food completely submerged in the brine solution. Simple design, easy to use & clean, consistently great results. A must have in every foodie's kitch..
$2.19 lb Cannot be shipped. Must be picked up locally..